Cystic fibrosis (CF) affects approximately 30,000 children and adults in the United States, and occurs in approximately one out of every 3,900 births. Over 10 million Americans are unknowing, symptomless carriers of the defective CF gene, which comes in over 1,000 mutations. When two carriers conceive, there is a 25% chance that the child will have CF, a 50% chance that the child will be a CF gene carrier. 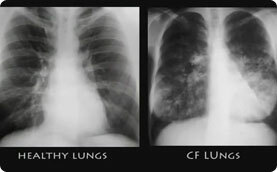 About 1,000 new cases of CF are diagnosed each year. Over 80% of patients are diagnosed by age three, but nearly 10% initially have more moderate symptoms and are only diagnosed at age 18 or older. Additional information can be found at the Cystic Fibrosis Foundation website, www.cff.org.